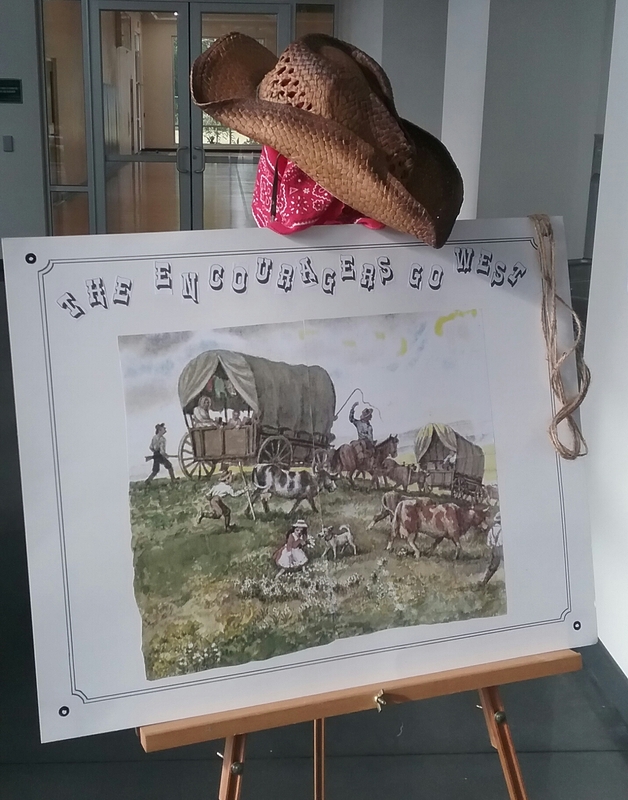 Our dinner theme was “The Encouragers Go West”. Our Sunday School class is named The Encouragers. 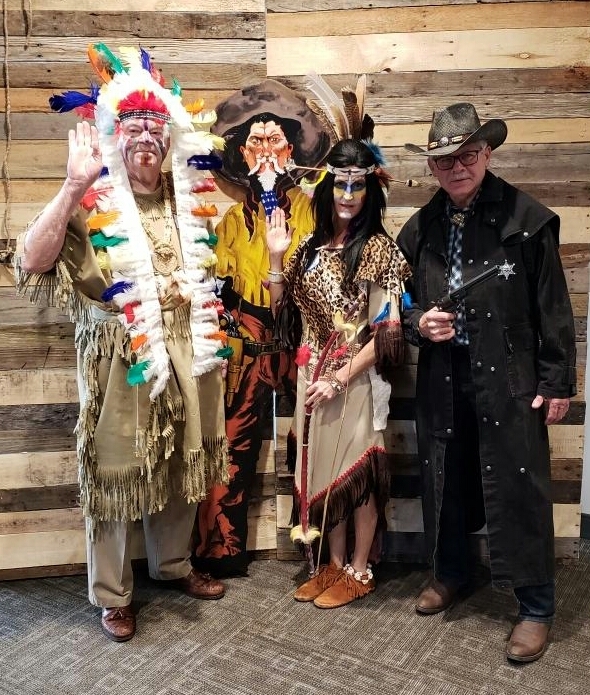 Sitting Bull, Pocahontas, and the Lone Ranger. After the photo, the Sheriff joined them and said hello to the security guard. They explained to him why they were all dressed up and he chuckled. The four characters walked into Ann’s husband’s room and he started laughing. “Thanks for coming to take my mind off my illness and make me feel better.” A nurse entered and laughed. “Would you like me to take your photo?” “Yes, please do,” they replied. The four characters who cheered their brother in Christ. After chatting awhile, they said goodbye and went to the next church member’s room. She beamed and perked up when she saw her friends in costume. As they walked down the hall, a male patient shouted, “Hey, come see me too!” They greeted him and he grinned and laughed. 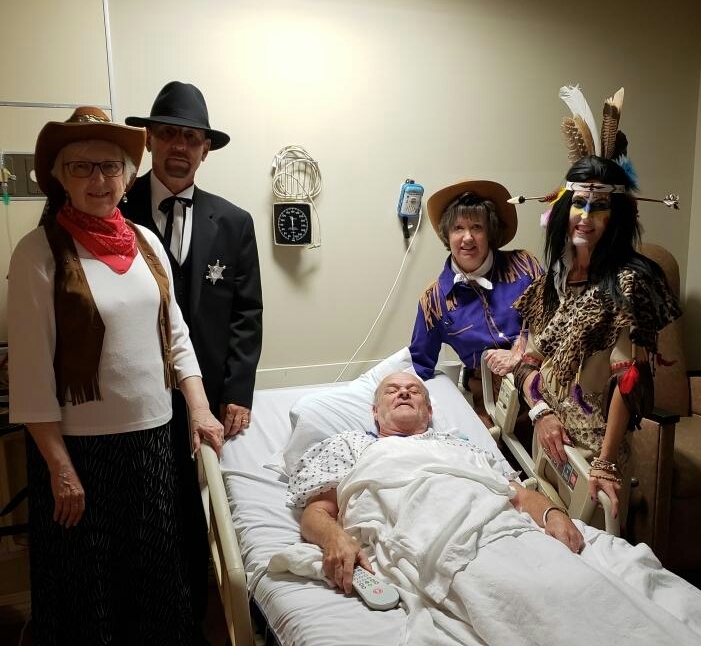 Before they exited the hospital, a number of people in the lobby smiled and told them how much they liked their costumes. Amazing how their humorous costumes could bring a brief moment of joy to so many people. God wonderfully created us to laugh and to have joy in Him. Christ is the only true source of everlasting joy. The word laugh and its forms occur 38 times in the KJV Bible; joy occurs 213 times. We can have joy even in the midst of sorrow. Laughter boosts your relationships. Men love women who laugh. Women laugh 125% more often than men. Laughter has social benefits. It’s contagious! Laughter gives your organs an internal workout. 100 laughs have the same health benefits as 15 minutes on an exercise bike. Laughter helps you lose weight by increasing your heart rate and metabolism. My dear friend Opal always wanted to be a nurse, but she met a handsome man in his Air Force blue uniform. He swept her off her feet, and they married as soon as she graduated from high school. She loves to laugh and gave me some funny stories to pass along to my nurse friends “to lighten their day”. Answers children wrote for their science exam questions. Question (Q): What are steroids? Answer (A): Things for keeping carpets still on the stairs. Q: What happens to your body as you age? A: When you get old, so do your bowels and you get intercontinental. Q: How are the main parts of the body categorized? A: The body is consisted into three parts – the brainium, the borax, and the abdominal cavity. The brainium contains the brain; the borax contains the heart and the lungs, and the abdominal cavity contains the five bowels: A, E, I, O, U.
Q: What is a fibula? A: A small lie. Q: Give the meaning of “Caesarian Section”. A: The Caesarean Section is a district in Rome. Q: What does the word “benign” mean? A: Benign is what you will be after you be eight. Feel free to share your humorous stories with us in the Comments section! I enjoyed reading your post! I’m glad God created humor, and sometimes I even amuse myself. this verse is on a plaque on my living room wall. It once was on the wall of my Dr, Grandfather’s medical office. It is so true that laughter comes out of a merry heart that flows from God Who is the Great Physician! A wonderful verse. Thanks for sharing. Jackie Cook on Do Nurses Cry?